We’ve known this all along, but still many people don’t believe it. Citizens living here from the rest of the EU/EEA give much more to Britain than they take. They are a boon, not a burden, and we’d be poorer without them. Last June in Parliament, Philip Davies, the Conservative MP for Shipley in West Yorkshire, asked Damian Hinds, the Minister for Employment, what benefits are received by EU migrants living in Britain. However, Mr Hinds was able to point Mr Davies to a government website giving information about the tax and national insurance contributions paid by EU/EEA citizens in Britain for the tax year 2013-2014, and the benefits those citizens received in tax credits and child benefits. We already knew UK-dwelling EU migrants pay six times more tax and national insurance than they claim in ‘HMRC benefits’. These are specifically child benefit or tax credits. But the figures released for 2013-2014 threw up some surprises. French citizens living in Britain are the European nationals contributing the most to the Treasury coffers. In 2013-2014, they contributed £2.3 billion in tax and national insurance. Yet they only took £90m in tax credits and child benefits. Second on the list of biggest contributors were the 790,000 Polish workers in Britain, who handed over nearly £2.2 billion to our Treasury in 2013/14 (the latest figures available). They took £911 million in HMRC benefits, meaning that they gave 2.4 times more than they received. The most impressive gulf between what’s paid in tax and claimed back from HM Revenue and Customs was by Greek citizens working in Britain. They paid 31 times more in tax (£439 million) than they claimed in HMRC benefits (just £14 million). Not one EU/EEA country on the list showed any one of them taking more than they gave. Even the country with the smallest gap, Slovakia, had their citizens here paying almost twice as much in taxes as they took out of HMRC in benefits (£208 million to £122 million). Overall, citizens here from all EU/EEA paid taxes in one year totalling £14.7 billion, but only took HMRC benefits worth £2.6 billion. 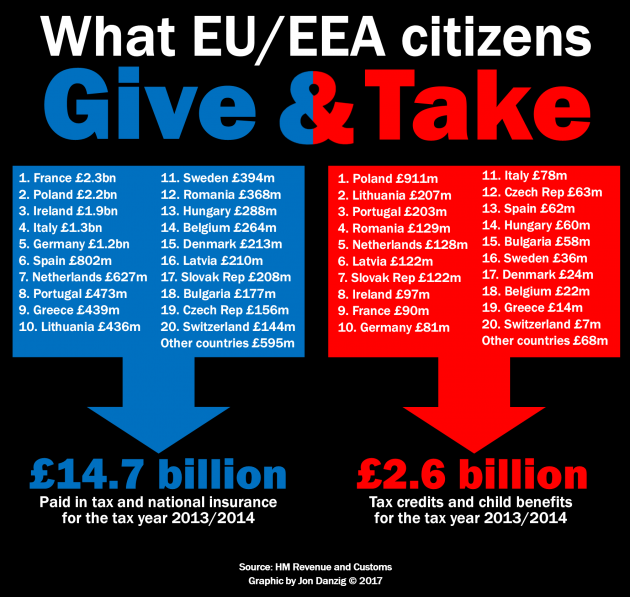 That means that in one year alone, citizens here from the rest of Europe gave almost six times more to the Treasury than they took in HM Customs and Excise benefits. (Switzerland is included in the figures because, although it’s not a member of the EU/EEA, it is part of the Single Market, meaning Swiss nationals have the same rights to live and work in the UK as EEA nationals). The HMRC benefit figures didn’t include DWP benefits, such as Jobseeker’s Allowance or disability payments. 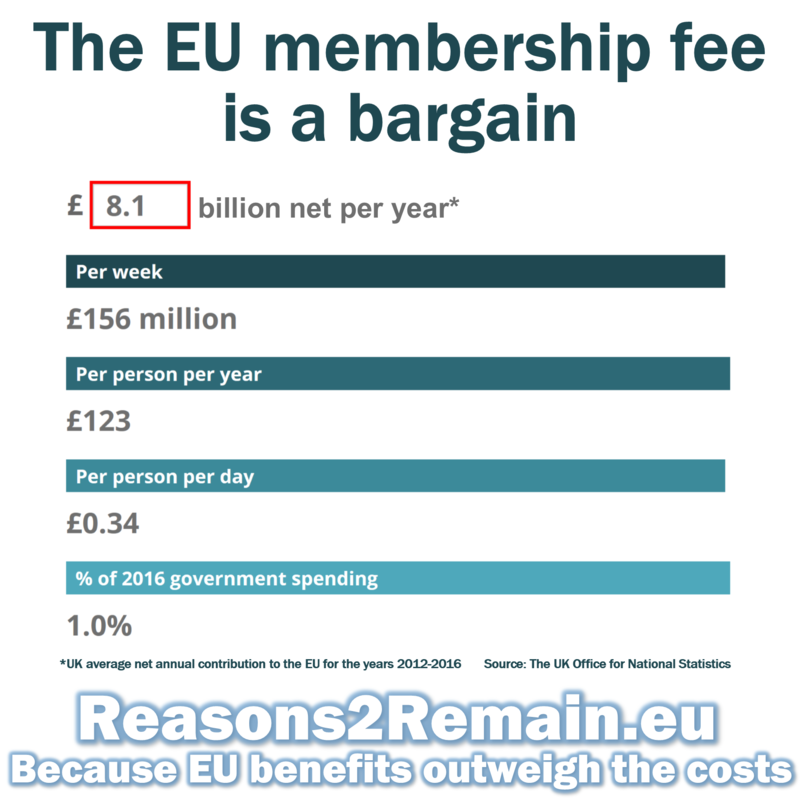 But even if they were included, there is still a significant net gain from the receipts of EU/EEA tax contributions versus the benefits they receive. Figures from the Department of Work and Pensions revealed that the out-of-work benefits paid to EU/EEA citizens totalled £886 million in the 2013-2014 tax year – just 3% of the total DWP budget for such benefits. These benefits include housing benefits, Jobseekers Allowance, and other out-of-work benefits. Total DWP benefits paid to EU/EEA migrants during the 2013-2014 tax year, including in work and out of work, came to £3.4 billion, meaning there was a net overall gain of £8.7 billion from EU/EEA migrants here in just one year. (Source at end of article). 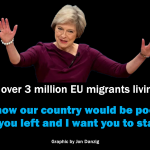 The DWP also reported that as of February 2015, only 21,460 nationals from the rest of the EU were claiming Jobseekers Allowance, and only 3,900 were claiming disability allowance. (See itv.com/news/2016-02-03/what-benefits-can-eu-migrants-claim/). In addition to income tax and national insurance, EU migrants living in Britain also pay a wide range of ‘indirect taxes’, such as VAT, duty on petrol, beer and cigarettes, as well corporation tax and business rates. Of course, this isn’t the full picture, and the overall calculations are far more complicated than simply deducting benefits paid out from taxes received. But in summary we can see: all those EU citizens working here are paying in taxes far more than they receive in in-work benefits. Their tax contribution also more than adequately covers the costs of the very small number of EU migrants claiming out-of-work benefits. And even after all that, there is a massive surplus from the tax contributions of EU migrants to help the country. 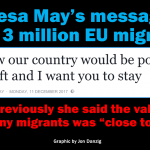 As part of his EU reforms before the referendum, the then Prime Minister, David Cameron, introduced an ‘emergency brake’ on the benefits EU migrants can receive, meaning that new EU/EEA migrants would have to wait four years to receive in-work benefits. This really should come as no surprise. We have known for years that EU migrants coming to Britain make a massive net contribution to Britain. They come to Britain to work, and fill job vacancies that there are simply not enough Britons to do. Most of these migrants are in full and gainful employment. They are often dedicated, hard-working and highly desired by British employers. Only a tiny proportion are claiming benefits, and none came for benefits. In extensive research undertaken by University College London, it was discovered that EU migrants arriving in Britain in the last decade (between 2001 to 2011) made a massive NET contribution to our Treasury of £20 billion. During the same period, British people took out MORE from the Treasury than they put in – a deficit of a whopping £617 billion. ▪ EU immigrants pay more in taxes than they use public services and therefore they help to reduce the budget deficit. ▪ The areas of the UK with large increases in EU immigration did not suffer greater falls in the jobs and pay of UK-born workers. ▪EU immigrants are more educated, younger, more likely to be in work and less likely to claim benefits than the UK-born. The fact is that EU migrants coming here are enriching our country (as do non-EU migrants). They are helping to pay for our schools and hospitals. They are contributing to our pensions. They are mostly in-work, paying-in more than they take-out, and spending most of their hard-earned earnings right here in this country. I asked the same question during the referendum campaign on the James O’Brien LBC radio phone-in programme. 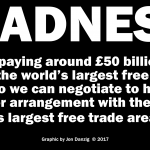 If so, that’s a high price the country will have to pay for Brexit, driven by xenophobia. ∞ Link to the government source for the statistics used in my graphic. This entry was posted in Politics & Public Policy, The EU and tagged brexit, child benefits, eu migration, EU referendum, HM Revenue and Customs, tax credits. Bookmark the permalink. Previous: Video: Can Britain stop Brexit?